In a place where everybody’s livelihood is yoked to the water, you have to follow the shells. T.J. Ward was born the year after his grandfather had the throat cancer surgery. T.J. never heard his natural voice. The seaman’s single clap would cut through the salt air on the docks of Apalachicola louder than words could. When he was a boy, T.J. didn’t draw dragons or superheroes. It was pictures of boats, netting and rigging just so. When he was 10, his grandfather named a boat after him. No one ever named a boat for you unless you were old or dead. But there it was: The Captain T.J. When he was a teen, his summer job was washing oysters. They were so plentiful then, he’d sit on the tailgate and eat a pile, scooping out the meat fresh from the bay, the shells falling like peanuts at a ball game. When T.J. was a young man, he left his family’s 13 Mile Oyster House, sustained for four generations by the daily miracles of Apalachicola Bay and the Gulf of Mexico, to try to make something different of himself in college. When the bay and his family were all but destroyed, he came back. And then T.J. did something he never thought he would. He motored into the waters of the next county, where such things are allowed, and began experimenting with technology that could leave four generations of Ward family oystering obsolete. T.J. Ward pilots his uncle's boat from one of their two long-standing bottom oyster leases in Apalachicola Bay. The fishery was declared a disaster in 2013 and since then oysters have become scarcer due to high salinity and an increase in predators. Saving Florida’s oysters is a shell game. The right answer is under three domes. Try to follow while the cups whizz by, shifting, swirling. Shell 1: An empty oyster bay. Unemployment. Poverty. But also history. Culture. 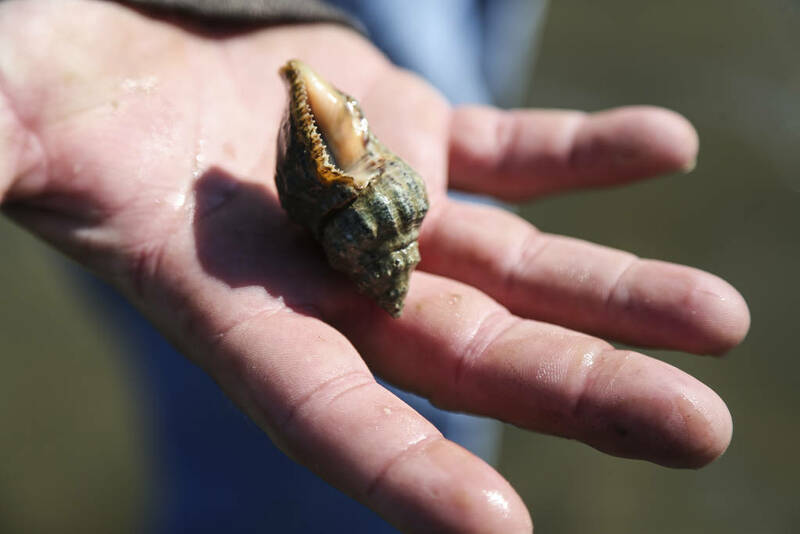 Shell 2: A slick farming industry that could render the Florida oysterman finally, permanently extinct. Shell 3: The government, doling out money and regulations that might do more harm than good. At Betsy’s Sunflower gifts in Apalachicola, the front window is taken up with oyster grill pans and oysters Rockefeller mixes. Apalachicola sheriff car panels are stenciled, “Oyster Capital of the World.” Chamber of Commerce T-shirts read “Got oysters?” And at Boss Oyster, just feet from the famous river, you can order oysters raw, chargrilled or broiled with all kinds of kooky topping combinations. But the sheriff cars are wrong. Betsy’s grill pans aren’t needed. The answer to the Chamber’s question: nope. And what your server won’t tell you unless you ask: Those oysters are from Texas. Most of the world’s oyster reef populations have vanished. Apalachicola used to account for 90 percent of Florida’s wild oysters, 10 percent of the nation’s. These days? Almost nothing. In 2013, the National Oceanic and Atmospheric Administration declared a fishery disaster on the bay and it has continued to diminish since. Only a handful of oyster houses and seafood markets remain on Water Street where it meets the Apalachicola River on the working waterfront of Apalachicola. For almost 30 years, a legal battle has raged over water usage. In 2013, Florida sued Georgia in the U.S. Supreme Court. Florida said Georgia was using too much water, leaving too little for Florida. This, Florida is still arguing, has caused Apalachicola Bay to become saltier and saltier, allowing predators to camp out in the estuary’s buffet. Whether the court sides with Florida or Georgia, any decision will likely result in more litigation. Amid the water battles came the oil. In 2010, almost 5 million barrels flooded the Gulf of Mexico when the BP Deepwater Horizon exploded. Some think oil killed the oysters, others that dispersant used to bead and sink the oil did it. After the spill and in advance of tar balls washing up, the oystermen petitioned the state to open the oyster beds. A huge oyster grab ensued, tongers scooping up anything harvestable with a looter’s zeal, leaving the bottom barren. In May 2017, T.J. stood in the shallows of Lease 609, water lapping at his rubber boots. The small bar used to be prolific, the bottom carpeted with clusters of brawny eastern oysters. He bent and hefted a snail, wound up and chucked it far inland. It was a good throw, T.J., 29, played baseball in high school. That predatory southern oyster drill would die before it made it back to water. T.J. Ward holds up a southern oyster drill that he pulled off an oyster at one of his two decimated bottom leases in the bay. These saltwater snails used to be held at bay with fresh water; increased salinity in the estuary has meant they can plunder oysters all year round. Oyster drills love the saltier water. It means they can inch into the bay from the gulf, searching for food with their siphons. They ooze sulfuric acid on oysters’ shells and use muscles covered with teeth to chainsaw inside, methodically sucking out the meaty bodies. Up close, it’s a slo-mo horror movie. But it’s only one of the things that keeps T.J. up at night. He got back in his uncle Dakie’s flats boat and headed out to meet tongers who had spent the morning bending over the back of a boat, dragging 10-foot-long tongs across the silty bottom until they felt the rattly vibration that meant oysters. They brought in a single bag between them. Ten years ago, that might have been upward of 30 bags. These days in Apalachicola, sales of wild oysters aren’t paying the lease fees for the sea bottom from which they are harvested. T.J.’s family has hunted oysters, shrimp and fish in Apalachicola Bay and the Gulf of Mexico for generations. But he’s hedging his bet. Across the water, not far, but technically in the next county, T.J. had 500,000 oyster babies hanging in mesh baskets near the water’s surface. Embracing the fastest-growing form of food production in the world, he is trying oyster aquaculture. 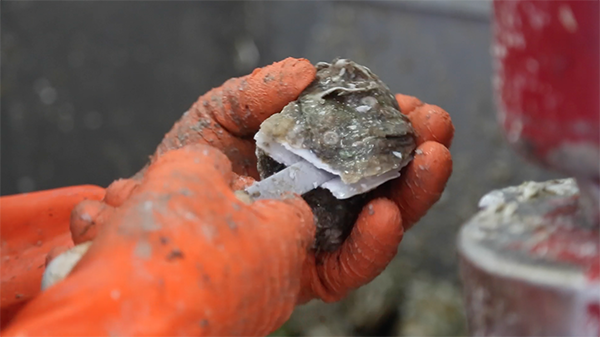 One foot in oyster hunting, one in oyster farming, his story sits where hidebound tradition butts up against new technology. T.J. Ward walks into 13 Mile Seafood Market, which his family owns, with a basket of local oysters. 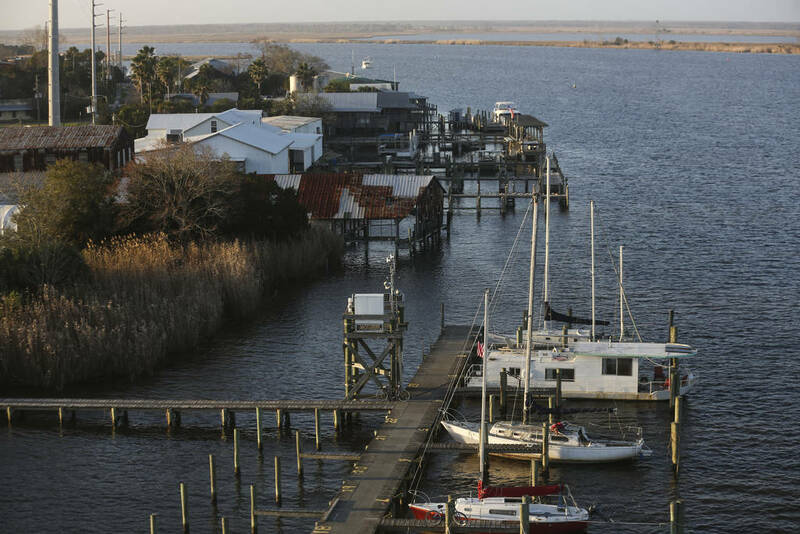 A hundred years ago, a third of Apalachicola’s male residents were oyster tongers; now you’ll see just a few boats out on the water and the daily take is meager. Satirist Jonathan Swift’s famous statement — “It was a bold man that first ate an oyster” — is only part right. It wasn’t man but proto-man, Neanderthals more than 100,000 years ago. In Native American cultures with access to these saltwater bivalve molluscs, pottery painting and other art proliferated. Folks had more time on their hands with all this abundant animal protein at their feet. In the same way the lowly lobster was sustenance for the indigent, incarcerated and indentured in colonial America, oysters haven’t always been fancy fare. In the early 19th century, oysters were a cheap, working-class mainstay in New York and London. The United States once produced more oysters than all other countries combined, 160 million pounds of meat per year, much canned in big factories. But somewhere along the way, this workhorse food became a delicacy. As demand increased, disease, overharvesting and fishery mismanagement sent stocks plummeting, causing prices to skyrocket. T.J. Ward shows a freshly shucked wild eastern oyster from one of his bottom leases. His family has been in the oyster business for four generations, but it is no longer a consistent source of income. Today, Americans eat about 2.5 billion oysters a year. They’re the objects of food fetishists and aphrodisiac seekers. Raw bars are trendy, at upscale weddings they’re de rigueur. Oyster experts speak of “merroir,” like a wine’s “terroir”: the animals carry a distinctive taste signature that says much about the environment in which they grew. Sustainable, local, shore-to-table, they’re a “feel good.” They improve coastal water quality by filtering seawater while creating ecosystems and habitat for other desirable species. 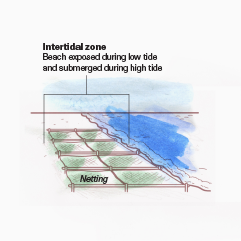 They protect against shoreline erosion. You don’t have to feed them with expensive fish meal, they don’t generate waste and they require no troubling antibiotics. They don’t move and they don’t have the ability to feel pain: A case could be made that they are as close to eating plants as it gets in the animal world. Let’s pause. Diners are not thinking about shoreline erosion and ecosystem health as they apply Tabasco or fancy mignonette, sleeves of saltines at the ready. They’re slurping something delicious, elemental, natural. Natural, yes. But 95 percent of oysters we eat today are farmed. 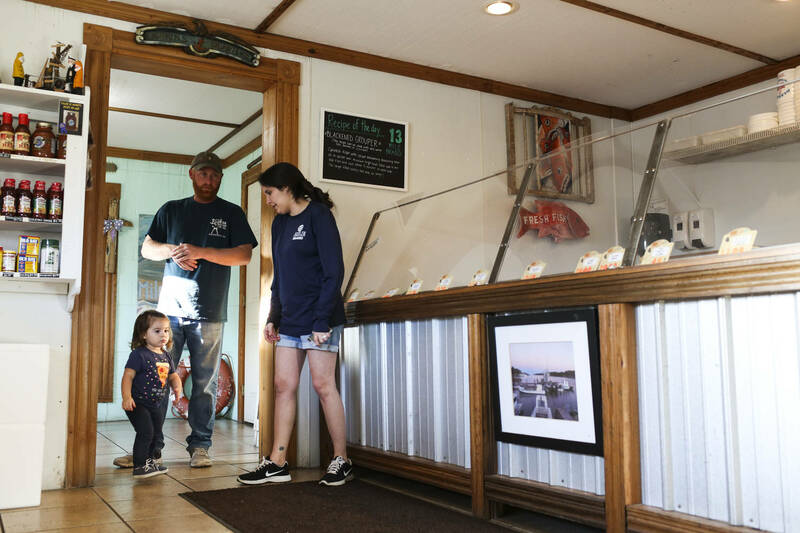 T.J. Ward, his daughter Ryan, 2, and his wife Melanie take a break while working at 13 Mile Seafood Market in downtown Apalachicola. Ward’s favorite time of the work day is when his wife brings his daughter to the market. T.J. and his daughter, Ryan, took a break from their family’s 13 Mile Seafood Market in downtown Apalachicola. He followed the 2-year-old along the wooden wharf, past the Miss Martha, named for T.J.’s grandmother. T.J. scooped up a hank of Ryan’s “You Have a Pizza My Heart” T-shirt in case she leaned too far waggling her fingers in a fountain. An American flag snapped overhead in the brisk marine wind. He wants her to grow up on the water, the way he did. She loves to be out on the boat, but who knows? Out at the oyster house, the cavernous storage room is empty except for ghosts. “This would have been stacked to the lights 10 years ago,” T.J. said, gesturing to the ceiling. Two lonely bags of local oysters await pickup in the cooler at the Wards’ 13 Mile Oyster House, which not long ago was filled nearly to the ceiling with wild eastern oysters. Apalachicola oystermen once brought in 90 percent of Florida’s wild oysters and 10 percent of the nation’s. In 1907, the bay was teeming with boats of tonging oystermen. These days just a handful go out looking for oysters. There are ghosts of the 50 people who used to work here — the tongers, the women who shucked, the housemen and truckers — but also family ghosts. Olan “Buddy” Ward was a code breaker in the Army, got out in 1957 and came back to run a little oyster and fish house 13 miles west of Apalachicola. 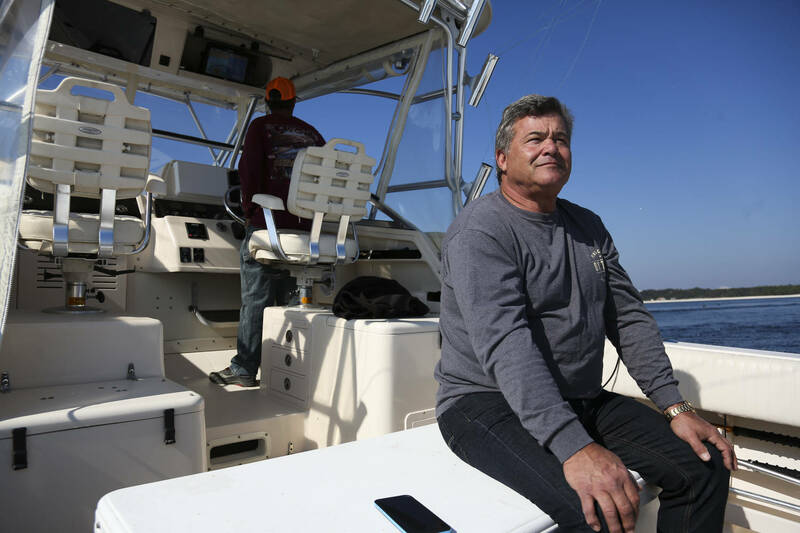 His family ended up owning half the lease beds in Apalachicola Bay, leases that never run out so long as the fees get paid. To establish a lease, they had to survey and mark a barren piece of bottom and plant it with shell to make a productive bed. Buddy was a big guy, firm handshake, looked a man in the eye. His dad had been a tugboat captain on the Apalachicola River during the Great Depression, tough times when watermen didn’t command much respect. Growing up poor, Buddy worked hard and passed that on to his five sons, Olan Jr., Dakie, George, Tommy and Joey. Olan Jr. ran the oyster house, but drowned boating back from hog hunting in 1978. Heartbroken, Buddy didn’t want much to do with oystering and Tommy took over. The oyster business has always been tough. In 1985, Hurricanes Kate and Elena buried the oyster bars, loads of oystermen pulling up stakes and moving to Louisiana. And it got wiped out in 2005 in Hurricane Dennis, roads buckled and closed, major Eastpoint oyster houses reduced to rubble. Underneath the water wasn’t any better, the storm surge bulldozing oyster beds, yanking out beneficial plants and increasing the bay’s salinity. Tommy was depressed; Buddy said they had to build it back. Buddy lived just one more year but got his way. T.J. had already left home by then. When he was a boy, he’d asked his father what about being in the seafood business in Apalachicola cost the most money. Lawyers and insurance, Tommy replied. T.J. didn’t much want to be in the insurance business, so he set his sights on law. He would fight for the seafood industry. In Tallahassee, he met Melanie Dufrayer. They worked at Calico Jack’s together, she as a server, T.J. shucking oysters. While dating T.J., she met Tommy Ward and told him she was studying psychology. “Please, do not try to fix me,” her future father-in-law said. When Tommy got bladder cancer in 2013, Melanie and T.J. spent a year shuttling back and forth. They moved back permanently and abandoned their studies. Now Melanie Ward, 26, works most days at the market, helping tourists in flip flops buying snowy fillets of grouper and snapper packed in ziplocks. T.J. and his dad scoot between the market, the water and the oyster house. 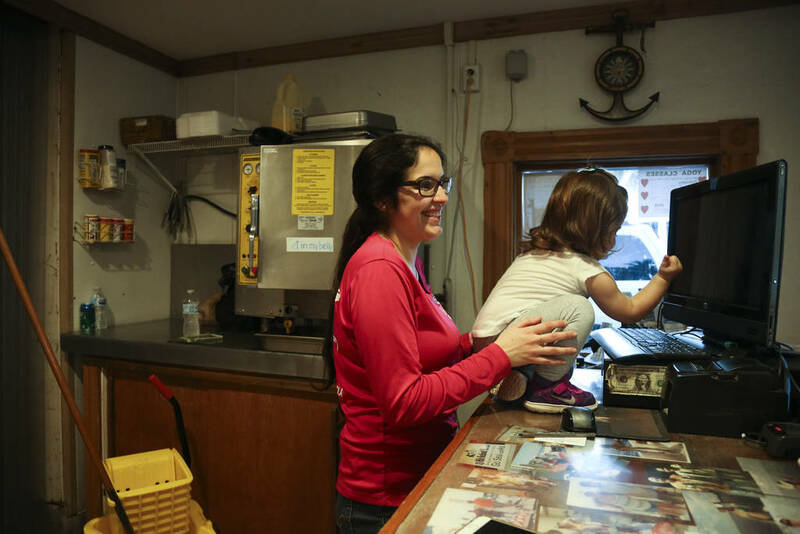 Melanie Ward lets her daughter Ryan, 2, play on the counter at 13 Mile Seafood Market in Apalachicola. The town is still famous for its oysters, but every day locals and tourists have to settle for Texas oysters when the meager local catch is exhausted. “All these things I said I wanted to do? I guess in the back of my mind I knew I’d always be back here,” T.J. said, leaning against a picnic table outside the market. With a fair complexion despite the sun and wind, he’s circumspect, more a listener than a talker. Still, Melanie says it’s fractious between T.J. and his dad. Out here, everyone has opinions about what went wrong in Apalachicola Bay. Ask T.J. or Tommy and you’ll get an earful that sounds a lot like the seven deadly sins. There’s pride, greed, envy, gluttony and, yes, sloth. 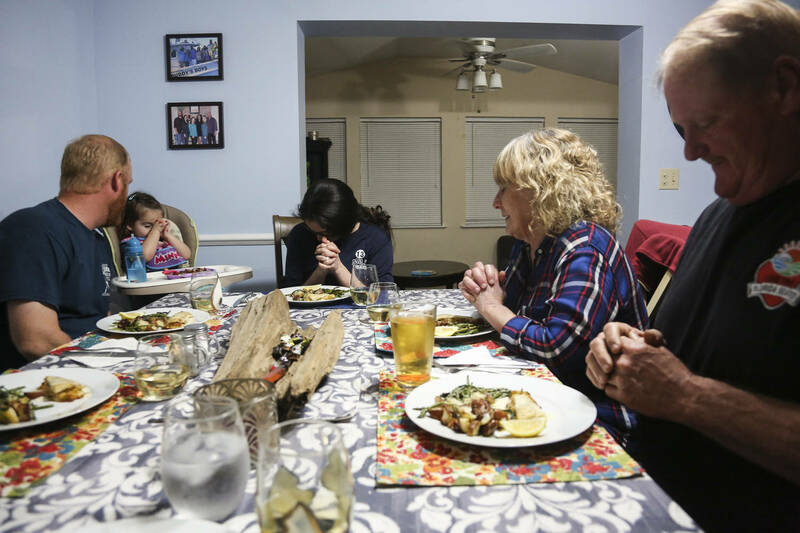 From left, T.J., Ryan, Melanie, Patty and Tommy Ward pray before dinner at T.J. and Melanie's home. Time was, a man and his wife could earn $700 or $800 tonging and be done by noon, Mark Henry said. His dad was an oysterman, his granddad still tongs every day. In the past couple years, he’s made money another way — loading up a boat with stones and shells and dumping it in the water. In the last round he was making $250 a day, enough to live off of. Each boat got $50 per load and could do 10 loads, two men per boat. The last time he went out there, he said, there were 75 boats. So that’s 150 people, mostly oystermen, making ends meet dumping stuff in the bay. Baby oysters need to adhere to something, preferably oyster shells. That’s how oyster reefs or beds develop. The Chesapeake Bay was decimated by disease and overharvesting, but also because millions of bushels of oyster shells were dredged to supply material for road and construction projects. The silty bottom provided no habitat for the next generation. Jonathan York, partner in Pensacola Bay Oyster Company, displays a handful of juvenile oysters growing in their hatchery in Pensacola. Young oysters are raised in tubs with circulated water and, when large enough, moved to a nearby water lease to continue growing in the bay. In Apalachicola, this wasn’t a problem before. In its heyday, the Wards’ oyster house was a flurry of short knives flashing and empty shells sliding down a chute into piles outside. 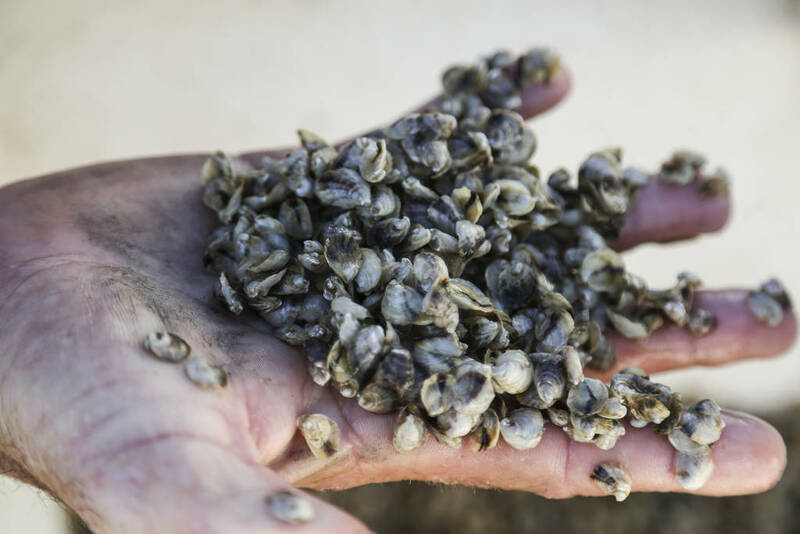 The shucking ladies would get poker chips to count their gallons and the empty shells — significant pause — would mostly get dumped back out in the bay. The country has had an oyster renaissance. But how are we eating them? Freshly shucked and on the half shell. Those shells mostly end up in landfills. That meant fewer shells going back to the bottom, but enough to get by. After the oil spill, things were different. 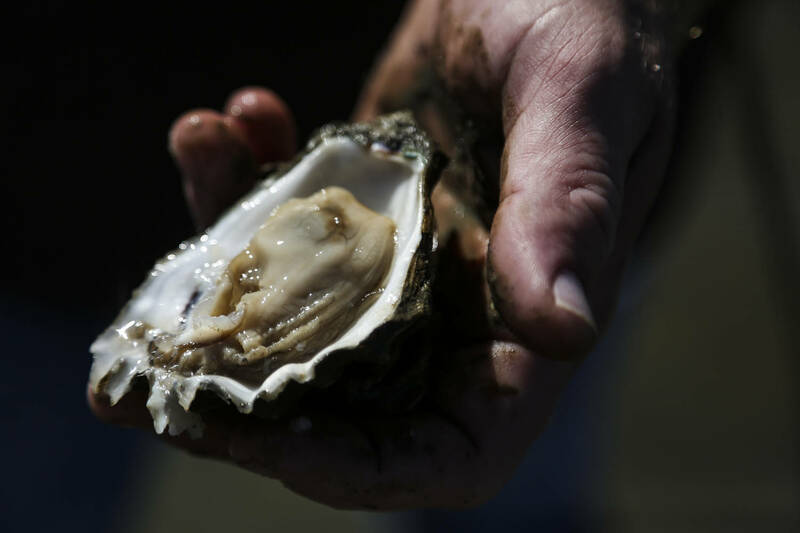 Oyster populations plummeted, so did shrimp, fish and everything else. A lot of Franklin County, home to the city of Apalachicola, was out of work. And this is where the state of Florida stepped in. Instead of closing the bay and letting it rebound naturally, the state employed out-of-work Franklin County oystermen to restore reefs by dumping limestone rock in the east end of the bay. From September to November 2017, $4.6 million in settlement money BP paid to the state was spent planting rock on 316 acres of existing oyster reef habitat. In addition to the Florida Department of Agriculture and Consumer Services’ $4.6 million, the Florida Department of Environmental Protection and the National Fish and Wildlife Foundation have administered another estimated $6.3 million to reseed and restore Apalachicola Bay and surrounding areas, some with fossilized shell, some with limestone, using BP settlement money. For perspective, Florida’s entire share of the BP oil spill settlement was $3.25 billion. And for more perspective, Visit Florida, the state’s official tourism arm, paid $12.7 million to finance Emeril’s Florida, a show on the Cooking Channel, the 96th most-watched cable network, that showcased Florida seafood in the hopes of eliminating any post-BP spill stigma. Sinking oyster shell seeded with oyster spat might have worked, Tommy Ward said, maybe even more fossilized shell. But limestone? Why limestone? The state goes with the lowest bidder. And that bid was for high-calcium content limestone rock. Other states have used limestone, but the science is muddy about whether it’s effective. Die-off or rebound, it’s hard to pinpoint precisely what’s responsible. Scientists agree that spat on shell is most effective. But shell is expensive and a limited resource. They also agree that if the sunken limestone sits long enough to have a layer of silt settle, wild spat won’t adhere, period. Oyster shells pile up on Water Street next to the oyster houses and seafood distribution companies. But in 1956, the mounds were much higher. 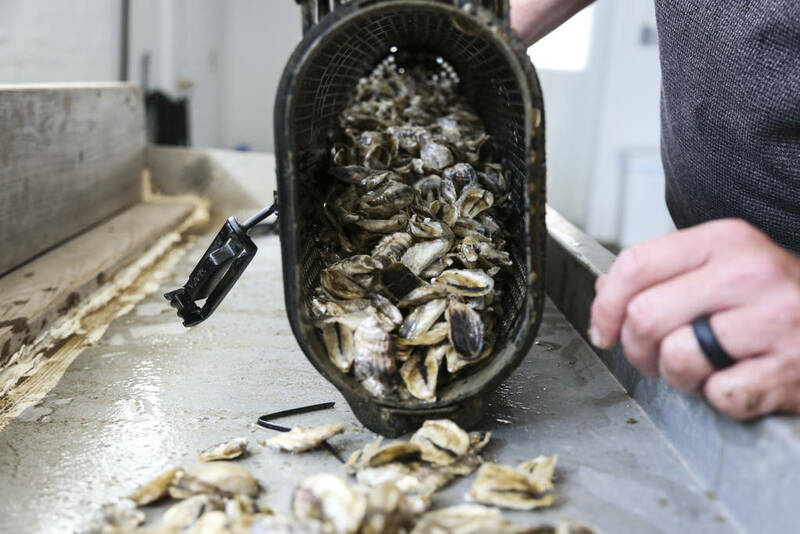 “It’s a welfare program for oystermen,” Tommy Ward, 57, said in May 2017 sitting in an Adirondack chair in the vestibule of the market, the glass cases cleared for the day. His face burnished like a rubbed penny, he wrestled with a packet of Starburst, angling for the pink one. When he couldn’t tease open the flap, he settled for cherry. It’s a make-work project, no different than digging a hole and filling it back up, Tommy said, only maybe more back-breaking. And even if the project were successful, it doesn’t solve the issue of high salinity. Still, no matter how hard things get, Tommy Ward said on that spring day, he would not take the state’s offer. He would diversify his business until the oysters come back, but he would not throw rock in the bay. Donnie McMahon surveys the water while heading out to his oyster hatchery in Pensacola. McMahon is founder of Pensacola Bay Oyster Company. The poem Invictus is about the triumph of the human spirit and overcoming adversity, written in 1875 when William Ernest Henley was in the hospital for tuberculosis after his left leg had been amputated at the knee. It is also the name of Donnie McMahon’s boat, a beautiful Grady White with creamy leather seats. The decline of wild oyster businesses like Tommy Ward’s has opened the door for entrepreneurs like McMahon to farm oysters. McMahon, 63, heads an insurance firm in Pensacola, with a dark shock of well-cut hair and a physique equally suited to a coat and tie or a weathered grey Pensacola Bay Oyster Co. T-shirt. Last year he won $100,000 for his oyster vision at the Innovation Awards, a Shark Tank-like business competition. He was born in Key West and grew up in Pensacola. A past president of the Pensacola Bay Area Chamber of Commerce, he’s got friends in Tallahassee. In 2013, county commissioners tapped him to figure out the best way to utilize expected BP money. “I was doomed to be on the water,” he said as Invictus pulled away from the dock in May 2017. 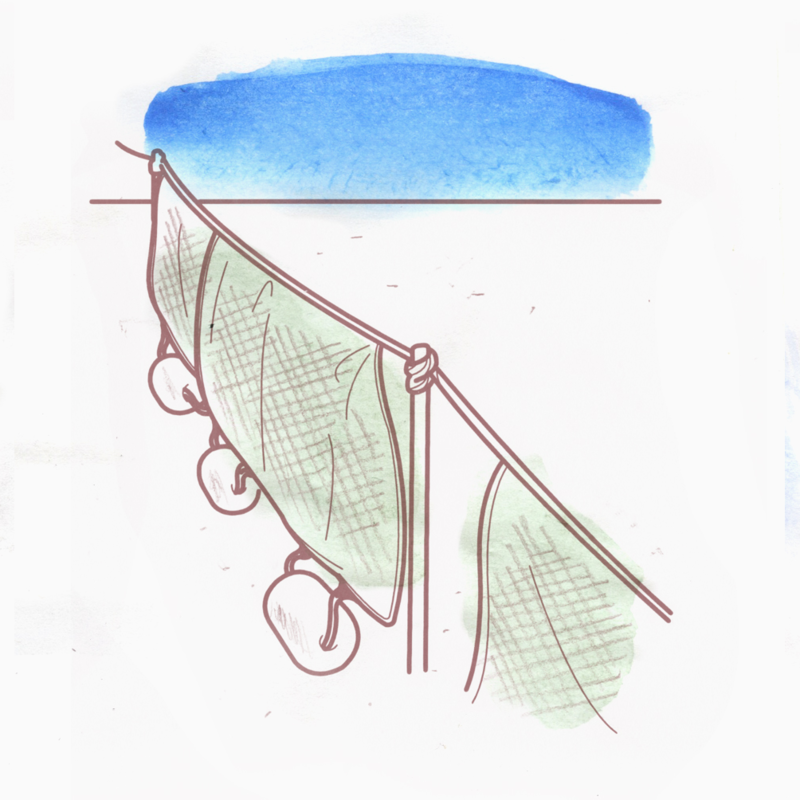 An avid camellia grower, he started tinkering with something else: He made mesh bags and zip-tied them to pool noodles. He bought 3,000 baby oysters, maybe a half inch, and floated them in different places. They all grew. By 2014, it seemed, McMahon was in the oyster business. The area’s wild oyster industry was destroyed after Hurricane Ivan, when discharge from a sewage plant dumped into downtown. Pensacola, once famous for its snapper, is poised for a seafood renaissance, McMahon said. 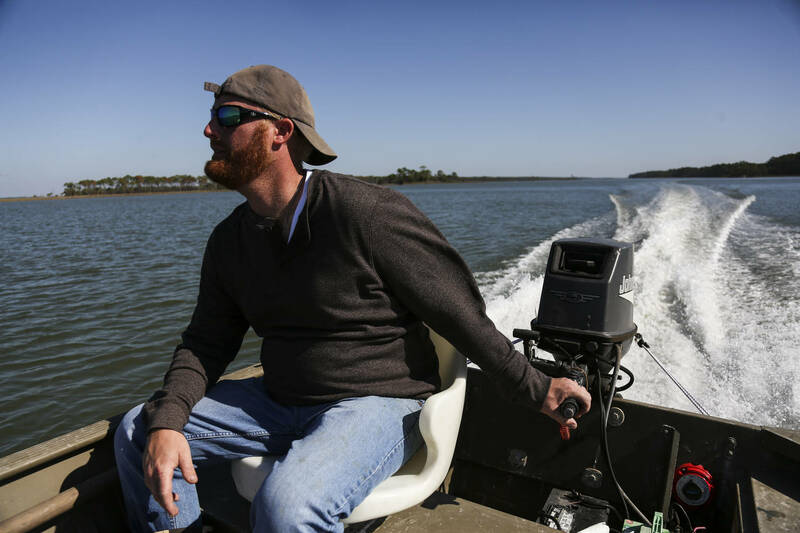 As he motored out to one of his two oyster farms, he rattled off details. He installed his equipment in 2016 and bought 300,000 oyster seed from the Auburn University Shellfish Lab. Florida farmers buy from Auburn or Louisiana State universities, two of only a handful of hatcheries in the Southeast. He aims to sell 10,000 a week, double that next year. He sells them wholesale for 55 cents each. If a restaurateur sells them for $2 each, the state is getting 7.5 percent, restaurant servers are getting 20 percent, the county is getting a cut. “From one harvest we’re creating a $50,000 local impact,” he figured. 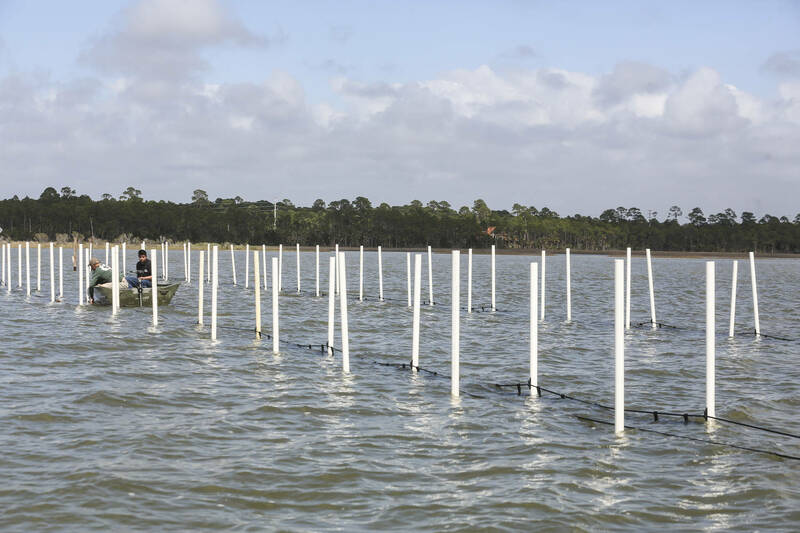 Empty oyster cages await young oysters from Donnie McMahon's hatchery in Pensacola. Once filled, these cages will be flipped weekly to expose the oysters to air and prevent tiny creatures from growing on the shells. He’s growing oysters in the water column rather than on the sea floor. You can see his Magnolia Bluff Farm from the scenic highway in Pensacola, about five acres of suspended equipment. Pairs of long black floats sit on the top of the water like bobbing railroad ties. Underneath each pair are suspended cages holding bags containing thousands of 3-inch, deep-cupped oysters, a genetic anomaly giving their shells a pretty bluish hue. His employees, battling tiny pinching crabs, waded into the sea of floats and began the laborious process of spreading out oysters by size into more cages to give them room to feed and grow, then flipping the whole apparatus so the oysters sit up top. They get flipped once a week to give them exposure to air and sun, to limit contaminants and predators and to prevent little creatures from growing on the shells. That’s the thing about farmed oysters. They aren’t as rough and funky as wild eastern oysters, usually more uniform, smaller and easier to eat. Pelicans sat on the floats, necks swiveling as they eyeballed the water. While other kinds of aquaculture produce a lot of waste, oyster aquaculture produces a lot of good fishing. It’s like a floating reef. 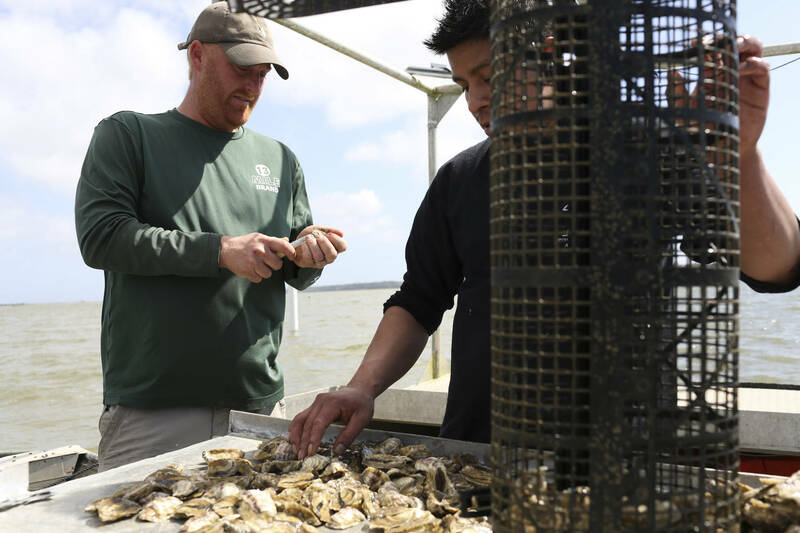 Donnie McMahon, left, and Jonathan York inspect oysters growing at their oyster hatchery at Pensacola Bay Oyster Co. 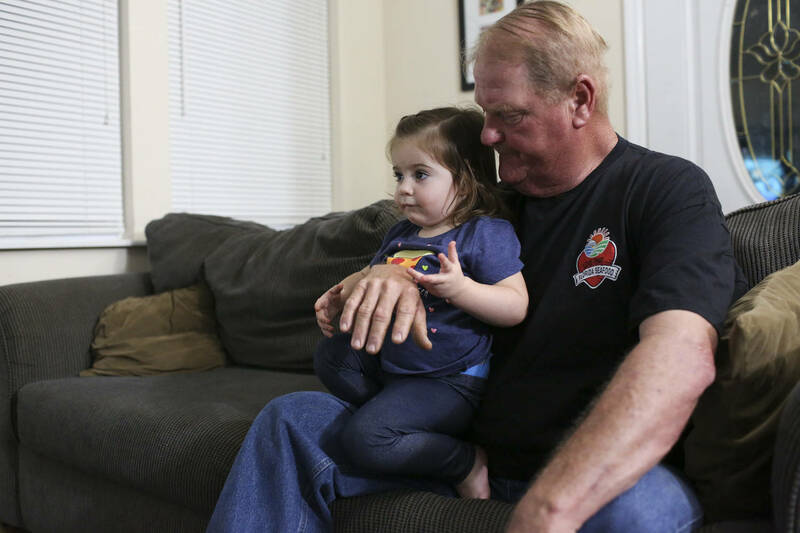 The biggest challenge for Florida oyster farmers is access to spat, or babies. Hatcheries in Louisiana and Alabama serve farmers in their own states first; Florida farmers are at the back of the line. As he headed over to his 70 cages at Garcon Point, where water flow makes the oysters taste slightly different, McMahon ticked off the people who have dived into oyster aquaculture: techie millennials, engineers, lawyers, biologists. In other words, those with educations and money. But mixing business and nature is not a sure bet. By the fall, McMahon had lost them all to a tropical storm. A deluge of fresh water killed 400,000 mature oysters. At 55 cents each, McMahon was out $220,000 in potential revenue. He started over. 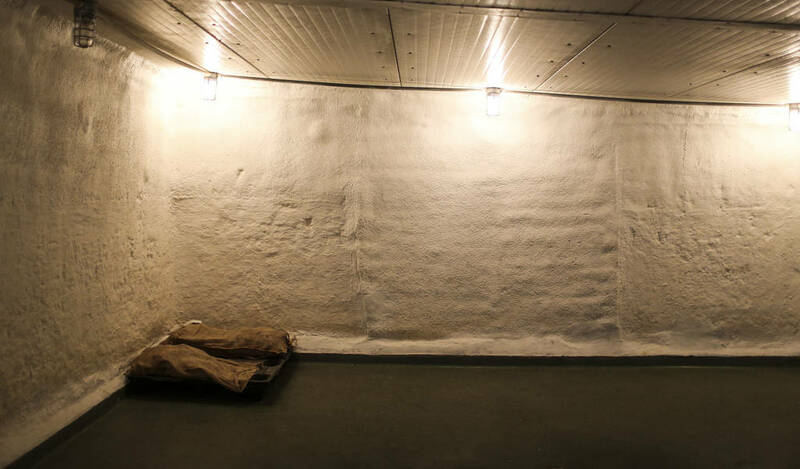 By March he was up to 250 cages at each of his two farms, ready to harvest a new crop, 50,000 mature oysters sent out into the dining rooms of local restaurants. Washington produces more farmed oysters than any other state, but Maine is coming on strong. 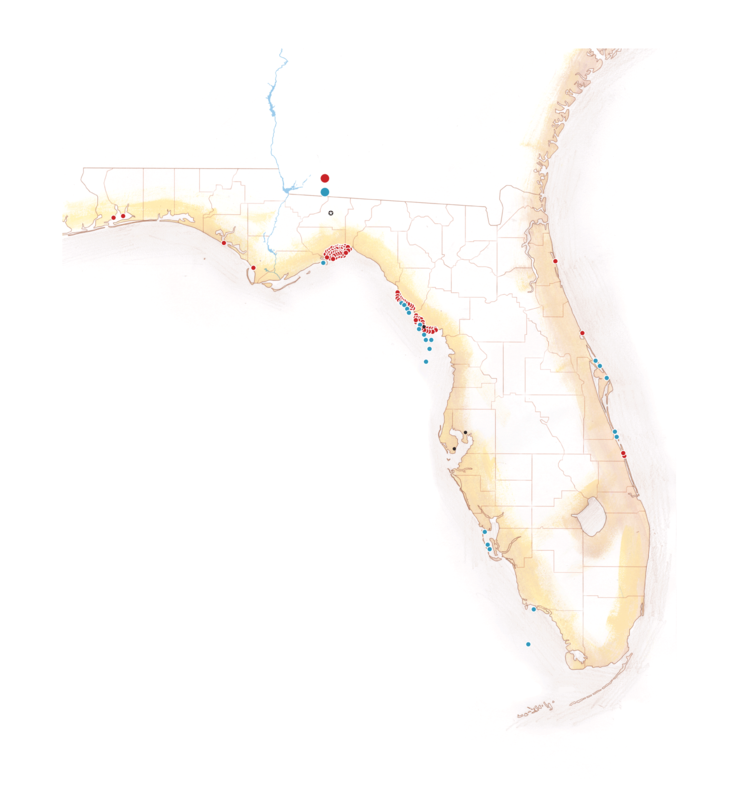 There are currently 151 water column oyster leases in Florida, although not all are active. In 2013, Gov. Rick Scott’s administration allowed for oyster farming at the water’s surface in 11 coastal counties. 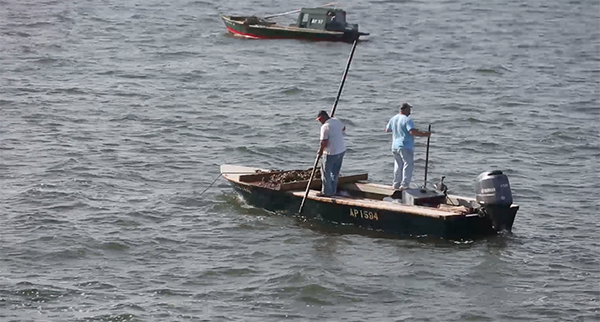 The rest of the country is waiting to see if Florida oyster aquaculture takes. The state has more farmable water than any other, miles of shoreline without big industry. Oysters grow fast here, maturing in just a year. In colder waters it can take more than twice that long. Because of this alone, Florida farmers could undercut northern producers on price. Since 2013, would-be oyster farmers have approached the Franklin County Commission, asking to try aquaculture. They’ve all been denied, except for farmers from two leases in Alligator Harbor, nearly an hour east of Apalachicola. So people like T.J. Ward who want to try their hand have to go into neighboring counties, crossing an invisible line in the water. Young oysters spread on a farm’s beach in the intertidal zone. 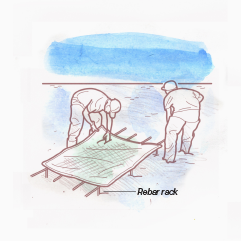 Some farmers protect oysters with netting or fenced pens. Young oysters placed in mesh oyster grow-out cages or bags, tied to steel rebar rack and staked 1-2 feet off bottom in intertidal zone. Oysters suspended underwater in vertical hanging mesh trays or lantern-shaped nets from buoys or rafts that float on the surface; oysters immersed in water all the time. Long ropes, stretched a foot or two above the bottom or suspended vertically in deep water, are inset with adult oyster shells with baby oysters set on them. Then why hasn’t the state tried harder to improve the health of the bay, the Wards want to know? 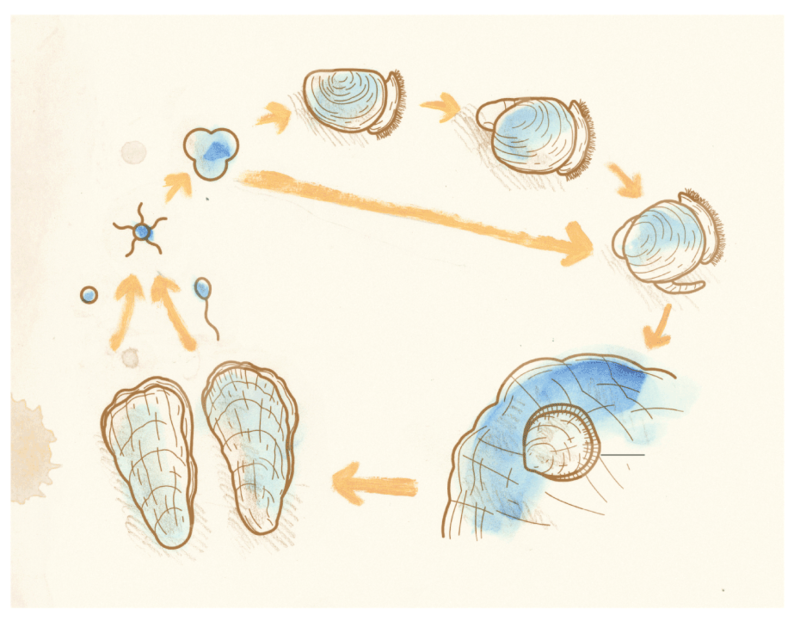 Upgrade to spat on shell, finally win the water war with Georgia or build a desalinization plant, figure out ways to combat predators, invest in a hatchery and oyster research. Oystermen drag 10-foot-long tongs across the silty bottom until they feel vibrations indicating the presence of oysters. The Wards wonder if the state is pulling for oyster aquaculture at the expense of wild oystering. The federal government, having seen the potential, released a plan in February to support research and streamline permitting for oyster farms. Farmers, too, are joining forces. Robin Olin, 63, runs the Panacea Oyster Co-op in Wakulla County, a group of 35 oyster farmers. Making has to replace taking, he said. Not that Olin and his co-op have had it easy with their “Panacea Pearls.” They experienced an 80 percent mortality rate in 2017. But Olin said they are on track to produce 15 million this year and maybe even show a profit. T.J. Ward and Tomas Juan retrieve oyster baskets at the water column lease where Ward is farming near Indian Pass in Gulf County. So far, he is farming two acres of his ten-acre lease, building up slowly so he doesn’t have to take out bank loans. There’s a downside to all that action on top of the water. 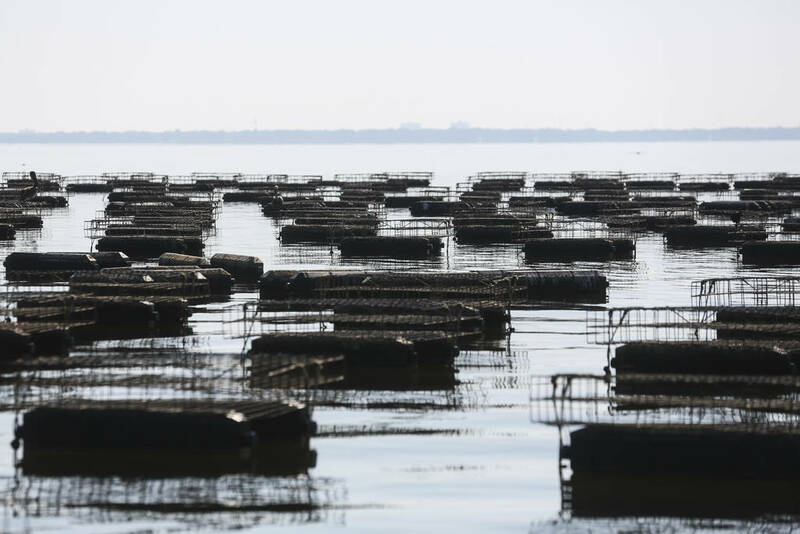 Floating oyster farms get in the way of kayakers, swimmers, recreational boaters. And they may impede other people from making a living. Guide fishermen, ecotour operators, shrimpers. And it could even mean war. Social psychologists and anthropologists talk about cultures of honor, where people are careful not to offend but quick to anger — and violence — when their own honor is impugned. Interestingly, this frequently happens in herding economies, places where a greatest possession and source of wealth is at the mercy of poachers or predators. Perceived fierceness, the theory goes, discourages rustling. And as far as herds go, there are no more sitting ducks than oysters. Oystering has always had turf battles, flats boats slicking through inky waters, the rasp of tongs in the night raking up illicit goods. T.J. Ward has had bottom-lease oysters stolen and even some of his fledgling farmed operation. “There’s always thieves,” he said as he threw a perfect cast net from the beach of St. Vincent Island, his favorite place. It’s where he routinely finds big shards of Creek and Seminole pottery in the sand. It’s where he proposed to his wife. Soon, nine gasping mullet flopped around the boat. 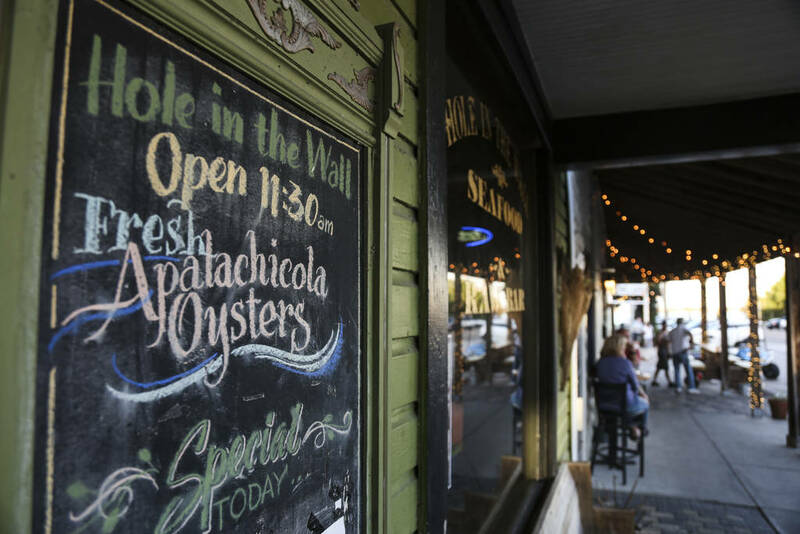 Hole in the Wall Seafood and Raw Bar advertises Apalachicola oysters on their menu. They will sell as many as they have and then they are 86ed. Other local restaurants substitute oysters from Texas or Louisiana, a fact they don’t advertise. And things get worse, he said. For the oystermen, it used to be beer, sometimes a whole lot of it. Now it’s drugs. Opioids and meth, they got here late. 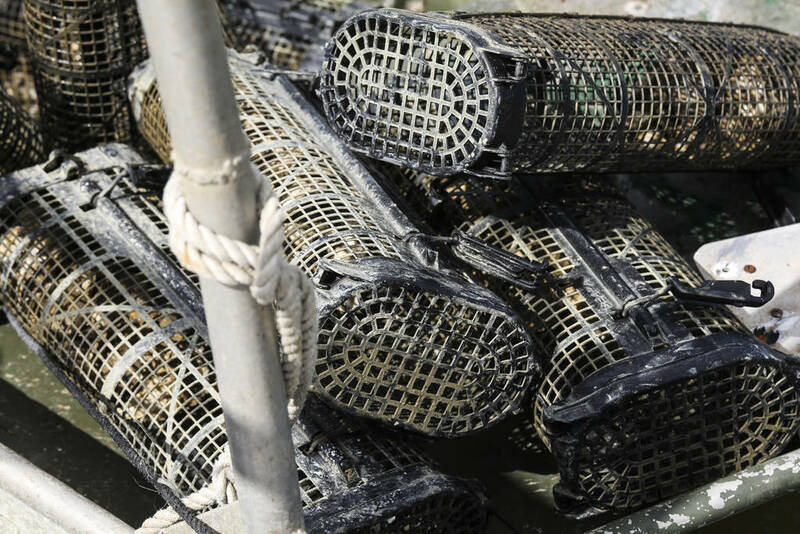 Tiny Franklin County has lots of crime: In 2013, the year the oyster fishery collapsed, Franklin had arrest rates behind only Bay, Hendry and Monroe counties. The county’s biggest problem is illegal drug use, said Franklin County sheriff A.J. Smith, the jail crowded with folks arrested for pills and methamphetamine. And it’s not like the oystermen can get in their boats and sail off to greener pastures. 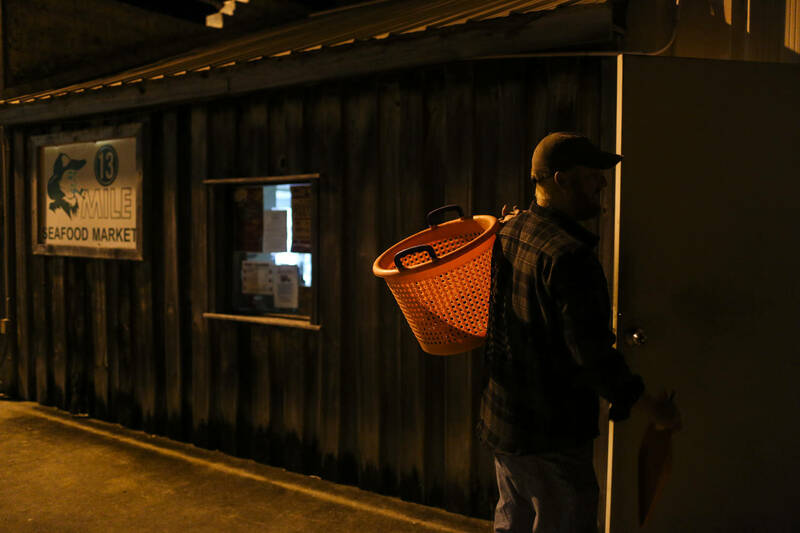 This year on New Year’s Day, Franklin County oystermen traveled down to Cedar Key in Levy County to hunt for wild oysters, even after being warned by Cedar Key clam and oyster folks that boats from Apalachicola would be burned. Sure enough, an oyster boat was torched, nothing left but a shell. The tongers met a similarly hostile welcome from Suwannee oystermen. T.J. and Tommy’s bottom lease devastation was visible in November. Yet one block from 13 Mile Seafood Market, at the Tap Room for dinner, there they were on the menu: 13 Mile oysters on the half shell. When pressed, the server said the oysters were from Texas; the Wards had not supplied them. That day, Tommy had been busy dumping high-calcium content limestone rock into Apalachicola Bay. The only thing you leave behind when you die is your name, Buddy Ward would say, so until the end, he was on hand to see the oysters sent out right. Tommy is like his dad — Melanie and T.J. can’t see him ever retiring. But he’s set in his ways, knows what he knows. Let the younger generation figure a way out of this mess, something that doesn’t involve dumping rocks in the bay. Tommy is the one who encouraged his son to explore aquaculture. T.J. is still in the first phase, using 2 acres out of his lease’s 10, paying as he goes so he doesn’t have to take out loans. To hear him talk, it’s less an exciting new venture, more a form of insurance. A business T.J. never wanted to be in. T.J. Ward and Tomas Juan look at Ward’s farmed oysters. Ward was happily surprised with how quickly the oysters are growing in their baskets. 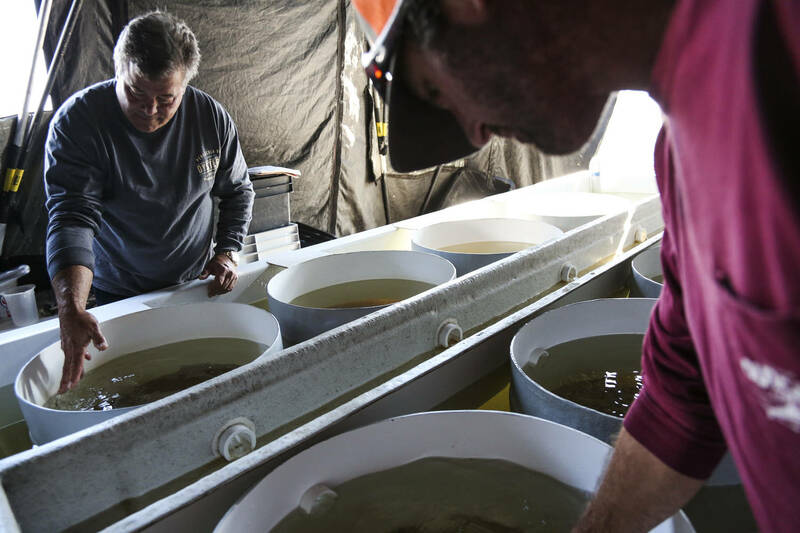 Because of warm, nutrient-rich water, Florida farmed oysters may mature faster than those in colder waters. At T.J. Ward’s farm, baskets available in a range of mesh sizes are clipped onto cables at the water’s surface. The baskets are designed to tumble the oysters, which helps to develop a deep cup and strong shell that won’t crumble when an oyster is opened. Whether farmed or wild, Apalachicola Bay eastern oysters have a unique balance of sweet and salt because of the brackish estuary waters. T.J. took off his ballcap and palmed his scruffy red beard. He looked older than 29. In January, guests paid $225 per person to attend an Outstanding in the Field dinner at 13 Mile Oyster House, a huge curving white-clothed table alongside a mountain of oyster shells tall as two men. It was the fifth time this famous, traveling, open-air feast, honoring local farms and the gifts of the land, had visited the Wards. What guests didn’t know, because T.J. didn’t tell them, was that he was debuting his farmed oysters, those ones he’d been growing over the county line. People ate 400 oysters in 30 minutes, celebrating their sweet, briny flavor. Tommy Ward didn’t attend. He didn’t think there was much to celebrate. Eve Edelheit contributed to this report. The U.S. Army Corps of Engineers produces a report for the U.S. Congress with a list of potential hydropower projects. One is the Buford Dam on the Chattahoochee River in north Georgia, to create a reservoir now known as Lake Lanier. Congress authorizes the construction of the Buford Dam, completed in 1957, diverting water away from its traditional path downstream to Florida’s Panhandle. Atlanta’s population continues to grow, as does its need for water. The Corps of Engineers releases a report concluding that some of the water being used for hydroelectric power at Buford Dam should be used to supply Atlanta with water for human consumption. Alabama and Florida file suit against Georgia in their conflict over the water supply; federal court authorizes the Corps to negotiate the conflict. As the Lake Lanier project was authorized by Congress, each of the three states is entitled to an equal portion of the water; the project was never envisioned only to benefit metropolitan Atlanta. Alabama and Florida file briefs stating that endangered aquatic species were being threatened due to a decrease of water levels downriver. After arbitration, the parties create two compacts: the Apalachicola-Chattahoochee-Flint between Alabama, Florida, and Georgia; and the Alabama-Coosa-Tallapoosa between Alabama and Georgia. Georgia also enters into negotiations with the Corps to allow part of Lake Lanier to be used for water consumption. Alabama and Florida challenge these agreements, no one can agree on minimum flow requirements and the 1997 compacts expire. A neutral arbiter rules that metropolitan Atlanta is prohibited from taking water out of Lake Lanier in order for a three-year negotiation period to begin among the three states. The Eleventh Circuit Court of Appeals reverses the 2009 district court decision and confirms the Corps’ authority to regulate Lake Lanier for Atlanta’s water supply. A court-appointed special master agrees that Florida has been harmed but ultimately sides with Georgia, ruling that Florida had not proved its case that a water-usage cap should be imposed on Georgia to help the river and Apalachicola Bay. He says Florida failed to prove “by clear and convincing evidence” that imposing a cap on Georgia’s water use “would provide a material benefit to Florida.” The Florida House Appropriations Committee estimates that Florida had spent $72 million in legal fees in the fight from 2001 to early 2016. Florida and Georgia present their arguments to the full Supreme Court of the United States in Washington, D.C. Justice Elena Kagan says Florida had “common sense” on its side. Justice Sonia Sotomayor says there’s “plenty of evidence on the benefits of additional water.” Justice Stephen Breyer says it would be “equitable” if Georgia had to share more water with Florida. A ruling is pending. 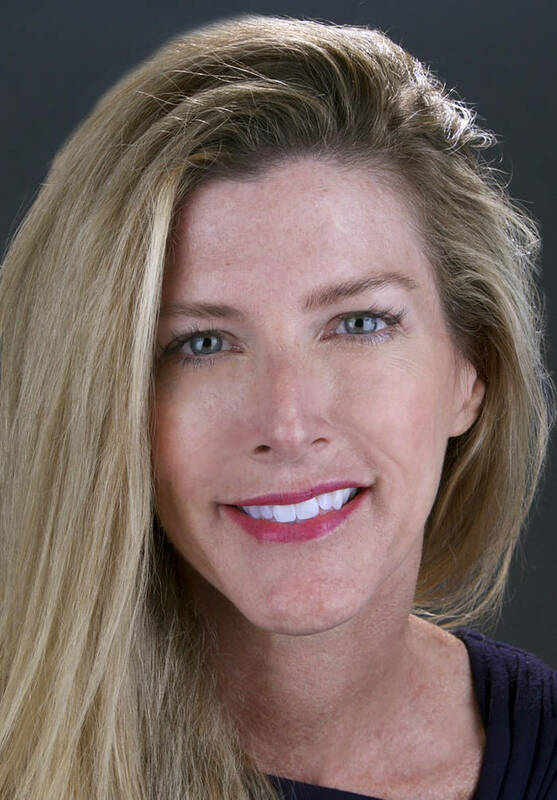 Tampa Bay Times food critic Laura Reiley and features editor Stephanie Hayes discuss the nation's obsession with oysters, the history of this perfect protein and their uncertain future. is the Tampa Bay Times' restaurant critic and a former critic for the San Francisco Chronicle and the Baltimore Sun. She is the author of four books in the Moon Handbook series: Florida Gulf Coast; Walt Disney World and Orlando; Tampa and St. Petersburg; and the Paradise Coast. She has cooked professionally and is a graduate of the California Culinary Academy. In 2017, she was a Pulitzer and James Beard finalist and won the Paul Hansell Award for Distinguished Achievement in Florida Journalism. Contact her at [email protected] or (727) 892-2293. Follow @lreiley. is a staff photographer at the Tampa Bay Times. She also has photographed two cookbooks: Food + Art and Bella’s. She graduated with a degree in photojournalism from the University of Missouri School of Journalism, and a minor in political science. 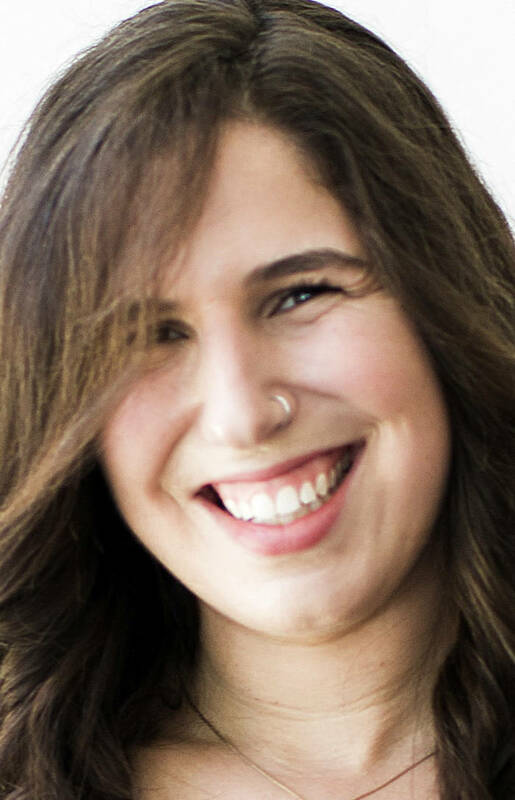 Her work has been recognized by NPPA, Hearst Awards, FSNE and the Green Eyeshade Awards. Contact her at [email protected]. Follow her on Twitter at @eve_edelheit and on Instagram at eve_edelheit.